Picnic & Play is a version of Porridge & Play that takes place in outdoor or cultural venues, such as a museums, galleries and parks. Rather than soup or porridge, we have a picnic meal, with the same delicious fruit and crunchy veg, cheese and hummus! The sessions take the same format as Porridge & Play – an hour of drama-led games, rhymes, songs and imaginary play for the whole family., followed by a delicious group meal. The session ends with Reflective Drawing and the Lickety Gallery, where everyone is invited to present their drawing and talk about what they thought about the session. Picnic & Play is an opportunity for members of the Licketyspit Children & Families network to meet and play the games they know together, and explore new cultural venues around the city. It is also an opportunity for new families to discover Licketyspit, and the Lickety Playcard repertoire! These free sessions are very popular and spaces are limited, so we have a ticket ballot system – email info@licketyspit.com to enter the ballot for an upcoming Picnic & Play. To find out about upcoming Picnic & Plays, follow us on Facebook, and join our Children & Families Network. 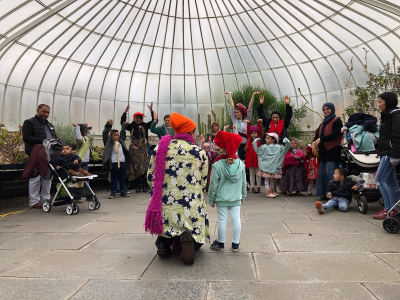 Picnic & Play has taken place in venues including WHALE Arts, North Edinburgh Arts, the Glasgow and Edinburghs Botanics, the Riverside Museum, Glasgow Green and the Glasgow Women’s Library. If you are involved in a community or arts venue and would like to find out more about hosting a Licketyspit Picnic & Play, please get in touch!